Caroline: We got 2 tasting paddles to share between the 3 of us so we could taste as much as possible. 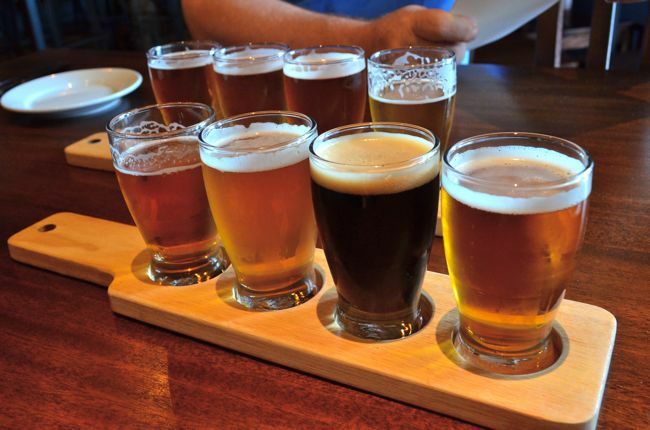 We had the Heavy seas classic lager, classic pale, golden ale, Märzen, their Peg Leg imperial stout, the Loose Cannon American Hop3 IPA and a Belgian Tripel that was a recipe from a home brewer who had won a competition. Kris: My 2 favourites were the Loose Cannon IPA and the Peg Leg Imperial Stout. Caroline: DITTO. how boring of me, but those were my favorites as well. The stout had coffee and syrupy-ness and enough hops to balance it out. Yum. Caroline: To start we had fresh oysters with a mignonette and cocktail sauce. 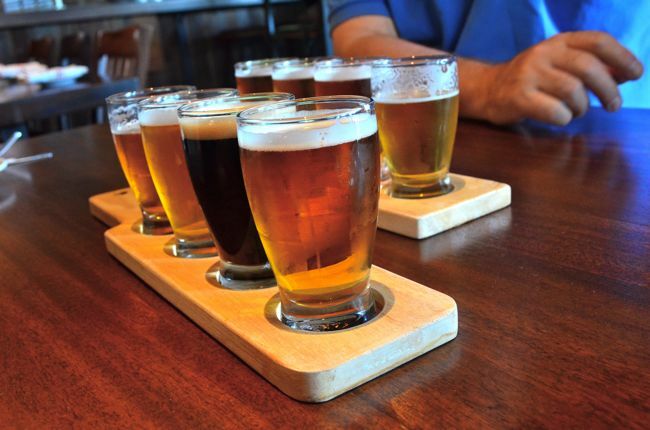 They used their Heave Seas Lager in the Mignonette instead of the traditional cider vinegar. Delicious. 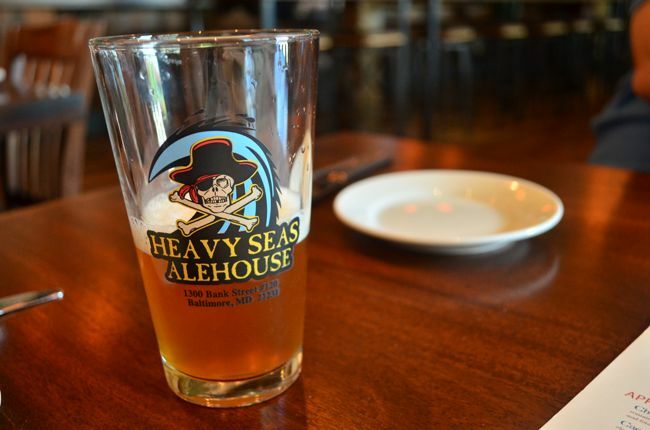 Kris: The Heavy seas lager was a great match with the oysters. They would also go really well with the Peg Leg stout. 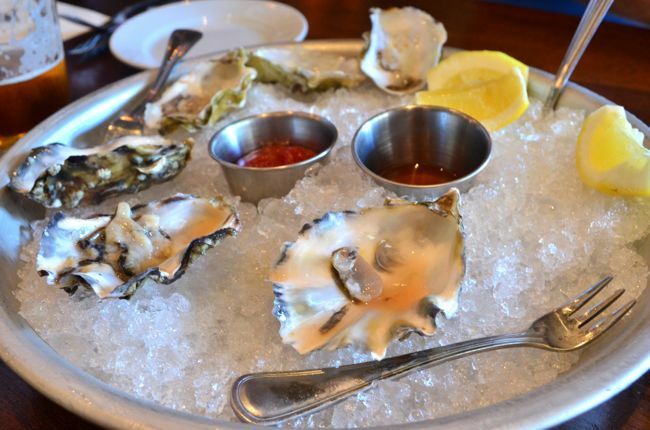 The oysters were super fresh and the mignonette made with beer was an interesting twist. Kris: The Loose Cannon IPA battered onion rings with whole grain Dijon & old bay/saffron mayo were cooked perfectly and a great snack to enjoy with the tasting paddle. Caroline: They marinated the onions in beer before they fried them. This made the onions nice and tender and prevented that annoying bite where the whole onion comes out of the batter when you eat it! 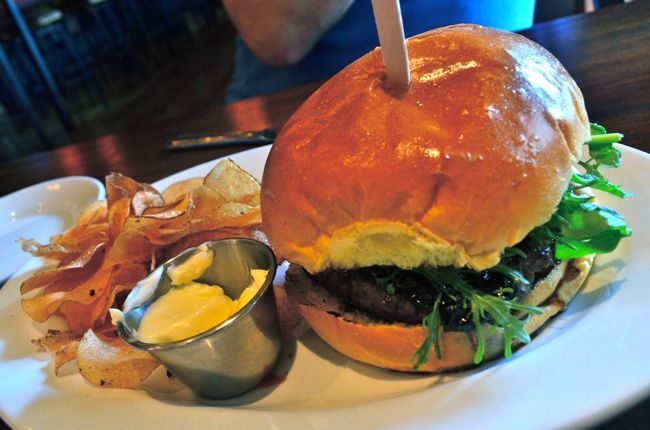 Caroline: The angus Beef burger was on a ‘spent grain’ roll, meaning they used grain from the beer mash to make the bread. How genius is that?? They also caramelized the onions in the Peg Leg Stout which gave them a more complex sweetness, it really added an extra something. 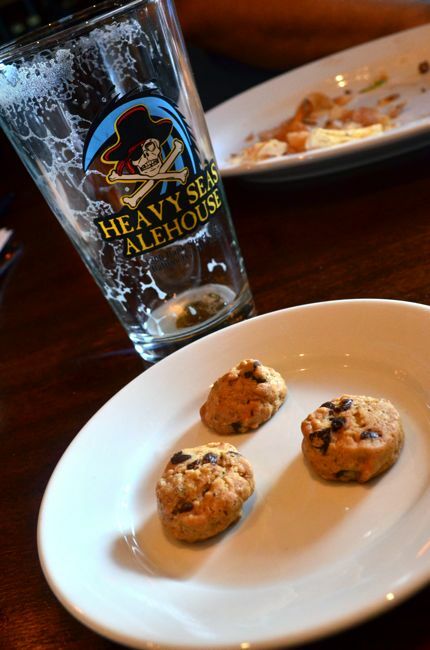 We matched the burger with the Heavy Seas Marzen. 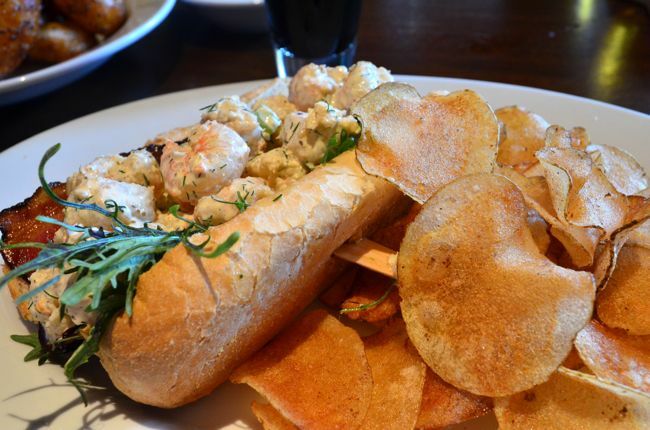 Kris: The Shrimp Salad Sandwich with thick cut smoked bacon and a side of organic greens was super tasty too. A great match for the sandwich was the Heavy Seas Golden Ale. 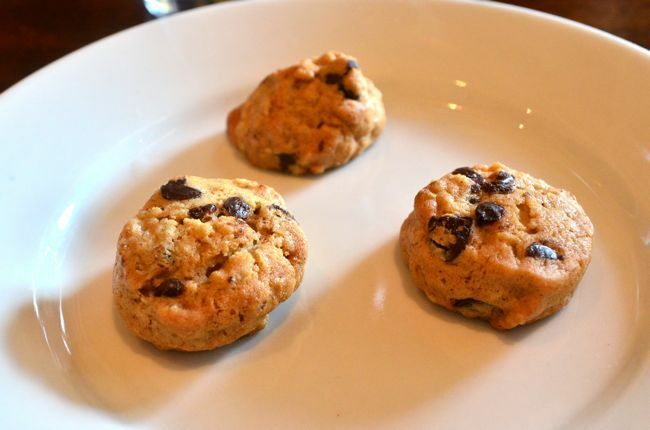 Caroline: To finish off the meal we got some complimentary spent grain choc chip cookies. 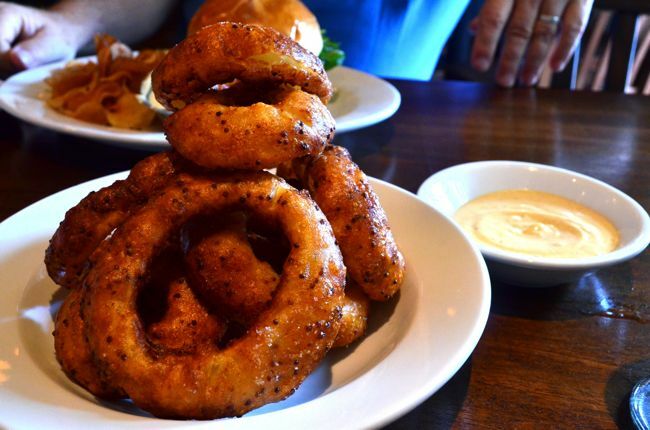 Perfectly bite size. 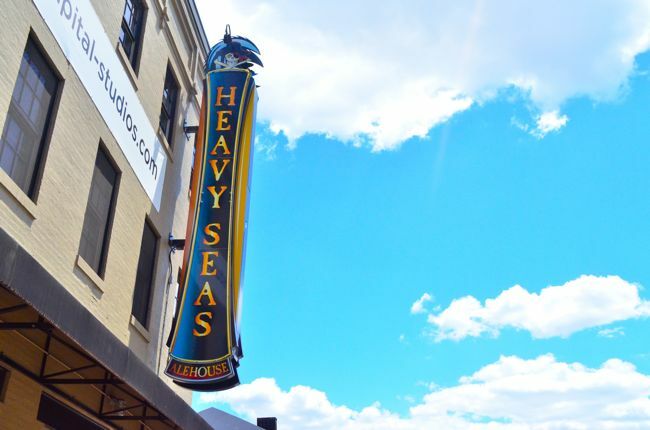 Kris: Overall we had a great experience at Heavy Seas Ale House. 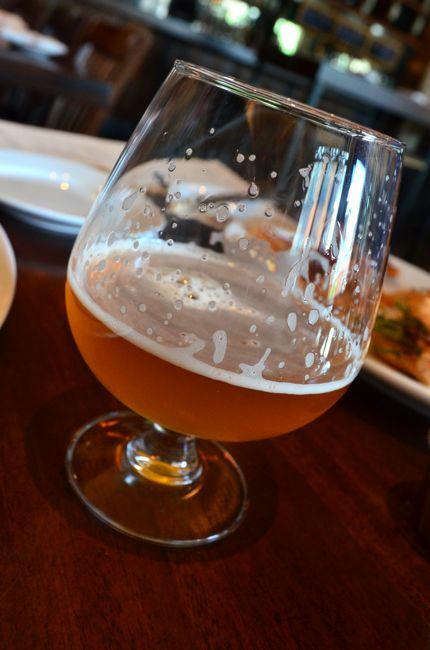 Great Beer, Great Food and Great Service. 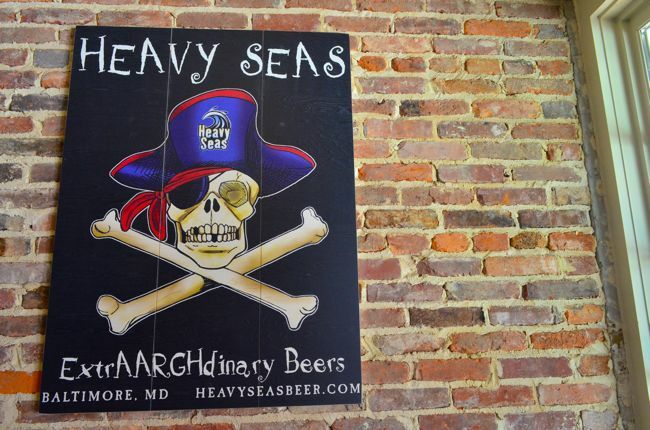 If your still thirsty, I recommend checking out Max’s Taphouse in Fells Point which is a short walk from Heavy Seas. It has over 100 beers on tap and 350 by the bottle. Definitely one of my favourite Beer Bars in America! Caroline: Overall, lunch was extrARGHdinary!